WCPS website homepage goes Purple on Thursday, April 18, to support Military-Connected students. On Thursday, April 18, Wayne County Public Schools (WCPS) will “Purple Up!” for military connected students. Teachers, staff, and community members are encouraged to wear purple as a visible gesture of support for students with a parent serving in our nation’s military. The WCPS website homepage, with the support of its web-hosting provider, eSchoolView, will also be changed from its traditional teal and green colors to purple on April 18. The Purple Up! initiative is supported by the Military Child Education Coalition (MCEC), a global non-profit organization focused on ensuring quality educational opportunities for all military children affected by mobility, family separation, and transition. It is worth noting that WCPS has been a member of MCEC since 2004. 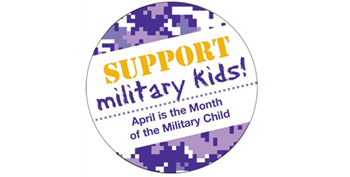 Each year, WCPS joins other MCEC school districts across the United States and Department of Defense Schools located around the world by recognizing April as the Month of the Military Child. In addition to Purple Up!, schools will hold various activities during the month of April to recognize and appreciate military connected students for their service and sacrifice. • Military connected students move 6-9 times during their K-12 years. • Military-connected children number almost 4 million, 75% of whom are school-age. • Almost every school district in America includes military-connected children and youth whose parents serve or served in the Active, Guard, and Reserve components of the Armed Forces. • Over 80% of these students attend U.S. public schools while less than 8% attend Department of Defense schools. Locally, WCPS has approximately two thousand military connected students.